This is the online learning plattform for a number of different training and study courses - we also call it your "virtual classroom". You can find a number of training courses on this platform - survival, safety, self-defense or the Open G Guitar course. Please note: in order to ACCESS A COURSE you need to REGISTER for the course first - a free account here alone will NOT allow you access a course. In order to enter your virtual classroom, please create a USER ACCOUNT if you haven't done so already. Please click the link "create account" on the right hand side of this page to create your FREE USER ACCOUNT; you can also make a language selection. Double-check your email address please, we can only contact you back and confirm your user account you state a correct, valid email address - use the same email address you used to register for the course, please! This user account will be free of charge for life. Once you have created your free account, your tutor/teacher will be able to register you in your course. If you have any problems with this learning platform, you can reach us by clicking the link at the bottom right corner of any page (Team MyCademy24). You will then be able to access your virtual classroom at any time and participate in the course you have registered for. In the virtual classroom, you can access all the learning material and media pertaining to your course. If you have any questions as regards your user account or course, please contact our team any time; you can contact us by simply clicking the link at the very bottom on the right hand of this page (or any other page within this iCampus). We are happy to have you here and wish you all the best! wir freuen uns über Ihren Besuch! Sie finden unten Links zu den aktuell verfügbaren Kursen in den verschiedenen Kategorien gelistet, als Übersicht darüber, welche Kurse wir derzeit anbieten. Diese Kursliste wird in nächster Zeit schnell anwachsen. Der ZUGANG zu den Kursen ist in aller Regel nur den angemeldeten Teilnehmern vorbehalten. Ausgenommen sind kostenfreie Kurse -sofern verfügbar. BEVOR SIE SICH FÜR EINEN KURS REGISTRIEREN LASSEN KÖNNEN, müssen Sie sich zunächst auf diesem iCampus als Nutzer anmelden; nur dann kann ein Kursleiter Sie später, nach ggf. erfolgter Kursregistrierung, für einen Kurs als Teilnehmer eintragen. Die Anmeldung als iCampus Nutzer ist KOSTENLOS und UNVERBINDLICH. Rechts unterhalb des Log-in-Bereichs finden Sie dazu den Link für die Einrichtung eines BENUTZERACCOUNTS - die Anmeldung dauert nur einen kleinen Augenblick; geben Sie bitte UNBEDINGT die korrekte Emailadresse und Ihren vollen Namen an, weil ansonsten später eine Kursregistrierung NICHT MÖGLICH ist. Fragen zu diesem iCampus oder einem unserer Angebote? 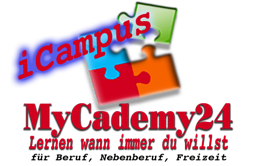 Bitte kontaktieren Sie uns gern jederzeit, entweder über unsere Website mycademy24.de oder klicken Sie den Link ganz unten rechts auf dieser Seite. Wir stehen für Ihre Fragen immer zur Verfügung! If you're not a registered user, you may not be able to access the pages you are looking for. In order to get access to any of our courses, please REGISTER for the course in question (a free account on Mycademy24 alone will not give you course access!). If you need assistance, please contact our team any time. You can find a link at the bottom right hand side of this page (MyCademy24 Team).